The Guitar Store previously had an online store which a little dated, made using Catushop and not performing as well as they had hoped overall. The brief was to firstly design a new style and feel for the website which would span across all their online marketing campaigns, which would enhance and complement their Brand Identity. Layout, usability and search ability for the site was also a priority, they required the new site to be mobile, tablet and desktop responsive and also have the option to view desktop versions while on mobile devices. The new site needed to be search engine friendly and built using a more up-to-date system for product scalability, backend usability and POS integration. The Guitar Store also required a Blogging platform on the e-commerce site with easy social sharing tools for the most popular Social Networks. 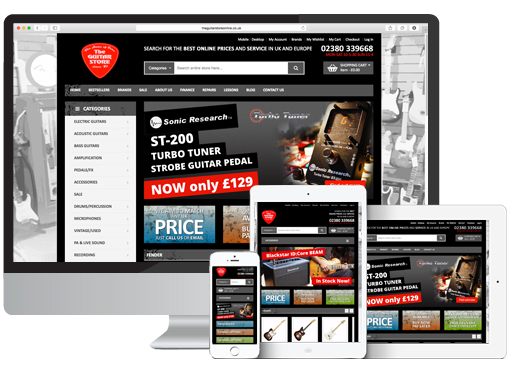 Product and content migration was also a requirement as The Guitar Store had spent hours uploading products and content to their old site, which they now wanted on the new site but did not want to input all the data again. Final requirement was to supply a suitable hosting platform for the site to run on. We designed the site to reflect and enhance the Guitar Stores new Brand, using the brand’s guitar pick graphic in creative promotional elements and by introducing an urban grunge and rock feel to the design elements of the site. The layout and functionality of the site was of up most importance, we built the site on the Bootstrap responsive framework providing an excellent structure for optimised layouts on mobile, tablet and desktop. We also created a non-responsive version of Bootstrap for the desktop view requirement on mobile and tablet, which could be toggled on/off as an option. We built the new e-commerce website using Magento, this is a great platform for building e-commerce as it is open source, updated regularly, secure and robust, scalable and also provides us with tools for making the site search engine friendly. We also integrated some excellent Magento plugins, such as the Sagepay Payment System from Ebizmarts and the shop-by-brand extension from Magestore. We migrated all the data from the Guitar Stores old website, which was build using Catushop. This included Products, descriptions, images, SKU’s, brands, prices, stock and data from old orders. We have also setup Google Shopping for merchants and integrated a Google Shopping feed into the site. Enabling the Guitar Store to list their products on the Google Shopping platform. The new site is now hosted with Hurley Internet on one of our scalable VPS servers.